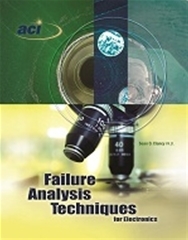 Failure Analysis Techniques for Electronics provides an overview of the characterization methods available at ACI Technologies, Inc. for determining the causes of failure in electronics devices. This publication will assist the reader in making informed decisions when troubleshooting a manufacturing problem and/or collaborating with an analytical laboratory. The proper selection of the appropriate test methods will help to identify the process conditions that lead to less than desirable issues and in turn assist in delivering a quality product. Full color images and data are provided, as well as real world examples of test results. 48 pages. Released January 2012.